This photo was taken by a recent Bimini Cage Diver. 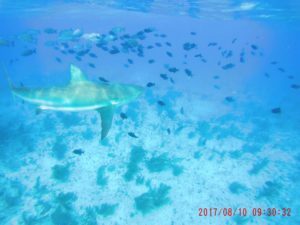 Our Bimini Shark Dives depart for Big Game Club Resort and Marina. The resort suffered damage during Hurricane Irma and will be closed until September 29th for repairs. The dive center is open now, so call anytime to schedule an incredible Bahamas shark dive. We can suggest alternate accommodations until the Big Game Club re-opens.